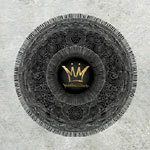 Following a triumphant 2013, the Mello Music Group celebrates the breadth of talent on deck with two new ''Mandala'' compilation CDs. Mandala Vol. 1, Polysonic Flows, is at once compact and comprehensive. Clocking in at twenty tracks, there is not a minute wasted and not a miss in sight. It is diverse and yet somehow cohesive, tailor made to rock your car speakers and your brain stem. It is MMG's reminder that hip-hop is alive and well, and a reintroduction to a label that's tried never to forget what makes music compelling. There is styles upon styles on this compilation. ''The Lost Nova'' ft. Mr. Lif & John Robinson is so sweet with the horn sample and drums. The lyrics are awesome! Mellow Music never disappoints! Produced by Oddisee (tracks 1, 11, 13); L'Orange (2, 9, 16); Has-Lo (3, 12, 18); Duke Westlake (4, 14); Quelle Chris (5, 6, 15, 20); Jeremiah Jae (7); yU (8); Castle (10); Slimkat 78 (17); Dudley Perkins (19).